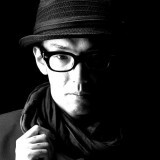 Born in 1980, Japanese DJ/Producer. At the end of the 90’s, he had a fateful meeting with House music, and settled on a career as a DJ when he was 21. He honed his DJ skills by organizing a lot of parties and performing with various artists. It also made his style of DEEP TECH, DEEP HOUSE, and MINIMAL. Since 2008, he started producing side of the business, and joined “Discovery V.A” in 2011. After that, changed his market to beatport and contimues to release from Asia Music, Slowpitch Recording, UNKNOWN season, Aba Recordengs, Cubek, Physical Techno Recordings and others. Thesedays, he gets a lot of offers for remixs. Recently, in Asia and Europe, his music has been played on FM radio program, and he has been playing at various GIG mainly in west Japan.